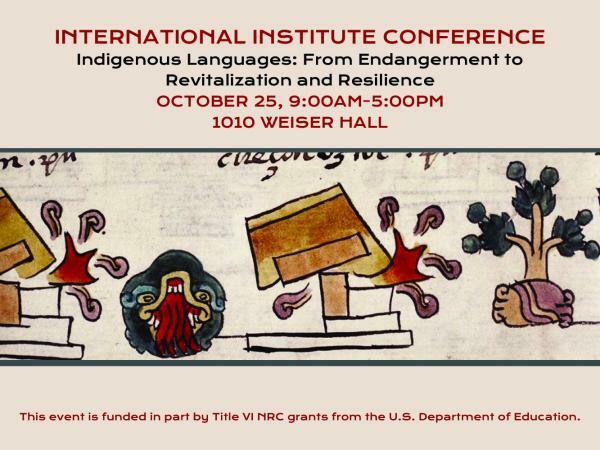 The United Nations General Assembly has proclaimed 2019 as the Year of Indigenous Languages, and the area studies centers at the International Institute will present a joint conference on the resilience and revitalization of indigenous languages. Policy recommendations resulting from the conference will be reported to the United Nations Permanent Forum. This conference will serve to strengthen ties between the University of Michigan and the UN Permanent Forum on Indigenous Issues (UNPFII). This event is funded in part by Title VI NRC grants from the U.S. Department of Education. For more details, please visit: https://ii.umich.edu/ii/news-events/all-events/ii-conference.html. This event is free and open to the public. No registration is needed. If you are a person with a disability who requires an accommodation to attend this event, please reach out to us at least 2 weeks in advance of this event. Please be aware that advance notice is necessary as some accommodations may require more time for the university to arrange. Please contact: lacs.office@umich.edu. Languages of Siberia indigenous peoples: is it possible to preserve? Language Prophets and Language Profits?